I have to say that this release date kind of snuck up on me. In fact, I forgot to post an update on the actual release date (June 26th), but Blackhearted Betrayal is now available everywhere! Well, you know, available in bookstores and for Kindle and Nook electronically, as well as via the book bookselling websites. =) This book is near and dear to my heart because it was so difficult to write when so many things in my life were falling apart, but it represents the strength I found (from within and thanks to my family) to push through and finish it. I also think it’s the best book I’ve written so far. We get to see things falling apart in Riss’s life and the supernatural world as a whole, and watch as SHE finds the strength from both herself and her loved ones to push through and come out on top, as she always tries to do. It’s not a perfect book by any means–I don’t think there’s any such thing, really–but it’s the best book I could write at the time. I hope that you enjoy it! I’m trying to put together some blog appearances and such, and I’ll link to those as they happen. I’m also planning to participate in a multi-author booksigning at Rose’s Book House in O’Fallon, MO on Saturday, July 14th. I’ll post more details on that when I have them. I also plan to appear at Archon in Collinsville, IL (near St Louis, MO) later this year. Take a look at the first volume of the Mortal Guide to the Gens Arcana, Vol. 1 graciously provided by the BSIMAR (Boston Society for the Improvement of Mortal/Arcane Relations). Write a one-paragraph explanation for which class of Fury you would like to belong to if you were a Fury, and why, in the comments section to this post. Contest will be open until 12:00 AM Sunday, June 5, 2011. I will then randomly select a winner and announce it on my website/Facebook/Twitter. The winner should then email me his or her name and mailing address so I can ship the ARC ASAP. I’m really looking forward to everyone’s responses and can’t wait to read them! 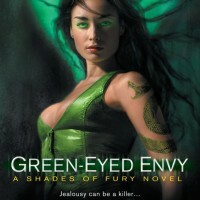 I’m completely thrilled to share that Green-Eyed Envy has earned my second starred review from Publishers Weekly. Considering how hard I worked to avoid the infamous “sophomore slump” on this book, I couldn’t be happier with this news! I have a guest blog post up at the RWA FF&P Chapter’s Blog about fear of the Sophomore Slump. Check it out! Also, I will be doing a book-signing at the Saint Louis City Public Library’s Central Express Branch in downtown St. Louis on July 7th from 11:00 a.m. to 1:00 p.m. You can find details here. Sneak Peek at Green-Eyed Envy, Chapter 1! I’ve posted the first chapter of Green-Eyed Envy. Go forth and enjoy! In other news, I am working on getting an answer on when Red Hot Fury will be available electronically. Yes, still. Sorry it’s taking so long but I will update as soon as I know the answer! Additionally, I am trying to schedule an author event with the St. Louis County and/or St. Louis City Public Library. I’ll update when I have more news on that, as well.